It’s one of my pet peeves – seeing a hat listed as an “exact replica” of Jack Sparrow’s from Pirates of the Caribbean, when even the most casual glance is enough to see they’re nothing alike (this happens a lot on Ebay.) Sorry folks, a brown leather tricorn does not a Jack Sparrow make – it takes a properly weathered look, a nice wide brim, and a rolled back. And even then, it’s not necessarily safe to boast your hat as an exact duplicate. Pyrate Leatherworx gets two instant kudos in this respect – first, they describe this hat as Jack Sparrow INSPIRED, rather than making the claims of so many other hat manufacturers. And second? It’s a pretty darn close replica. 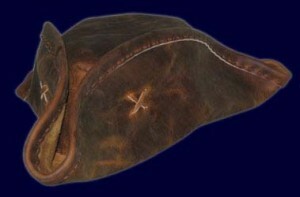 Pyrate Leatherworx makes a wide range of leather pirate hats, so there’s no need to limit yourself. But if the Jack Sparrow look is what you’re going for, then this hat can well be the cornerstone of your outfit. It’s handcrafted (Pyrate Leatherworx’s website describes in length that their products are truly hand made, as in without sewing machines and the like,) and is made from heavy duty leather. It’s appropriately dyed and aged to have that Jack Sparrow look we all love, and requires no break-in period before it’s ready to wear. So is it the perfect Jack Sparrow hat? For most people, certainly. Only the extremely detail oriented will notice that Jack’s hat in the movie has a slight gloss to it, whereas this hat is more of a matte finish. Or that Jack’s original had a domed top, as opposed to the more practical oval-stitched top of this hat, which gives it a slightly more squared profile. But I state these differences only in the interest of being truly thorough – they are in fact quibbles that 99.9% of folks would never remotely notice – and if you’re not looking to be a Jack Sparrow clone anyways, they’re not even worth mentioning. The Pyrate Leatherworx is truly top-shelf — it’s sturdy, and looks very authentic (as authentic as a leather pirate hat could be, that is – leather being somewhat impractical for wearing at sea.) The one caution I would offer is that the heavy-duty leather makes it just a tad cumbersome. You won’t have trouble keeping your head upright, mind you, but wearing it for extended periods can get a little trying if you aren’t used to it. My advice it to wear it around town a few times to get accustomed. This entry was posted in Clothing and tagged hats, pyrate leatherworx, pyrate trading co. by Bilgemunky. Bookmark the permalink. Do Not order anything from Pyrate Leatherworx – They will rip you off and you will never see your order. See the other review of their ‘custom’ hat, may bad reviews of unhappy customers. I, sadly, am one of them. Thank you for reminding me of the fact that, while my review of the Pyrate Leatherworx Custom Hat has received the most attention, I do in fact have other reviews of merchandise from this same company which should necessarily reflect the concerns broached by so many readers. I’ve now included the appropriate warnings and links to reader complaints in the hopes that your unfortunate experience might be avoided by others.